When teams around the league were creating the necessary cap room to poach a single superstar in 2010, Heat team president Pat Riley cleared the decks so that he could sign three. It’s under that context that the latest reports of Miami’s free agent interests make a great deal of sense. 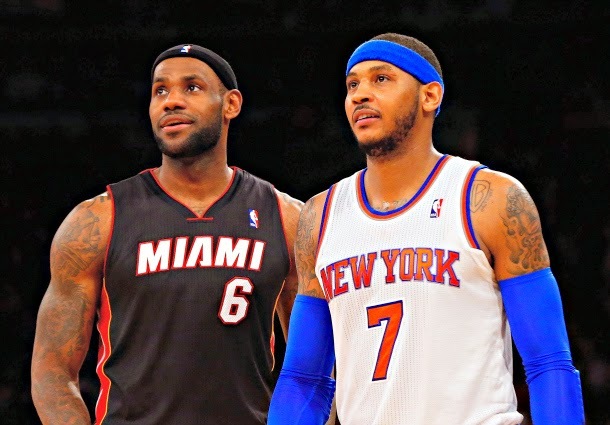 Not yet satisfied with having three stars (including the best player in basketball), Riley and the Heat are reportedly investigating the possibility of pursuing a fourth in free agency this summer: Knicks forward Carmelo Anthony, per Marc Stein of ESPN.com. Sources told ESPN.com that Heat officials and the team’s leading players have already started to explore their options for creating sufficient financial flexibility to make an ambitious run at adding New York Knicks scoring machine Carmelo Anthony this summer in free agency. Anthony, who could become an unrestricted free agent if he chooses to exercise his early termination option, could in theory be an addition to the three-star core the Heat already have in place. The salary cap math of such a signing, though, only checks out if James, Wade and Bosh all opt out of their own deals as well. Each of those three is slated to make $20+ million in 2014-15, which — when supplemented by Norris Cole’s $2 million guaranteed salary — is enough to put Miami over the projected salary cap ($63.2 million). A mutual opt-out between all three stars would clear the Heat’s cap almost entirely; Cole would be on the books along with player options for Udonis Haslem ($4.6 million) and Chris Andersen ($1.5 million), leaving room for James, Wade, Bosh and Anthony to all sign on new deals.